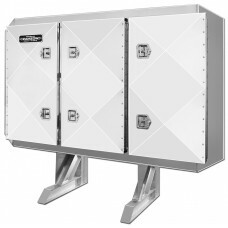 MODULAR ENCLOSURE – with internal uprights and three 14” deep compartments in a mill-finish body with stainless steel locking T-latches on diamond plate doors and chain hanger in each outside compartment. 3-DOOR ENCLOSURES – Three 14” deep compartment enclosure cab rack 86”W x 68”H, with a polished body and stainless-steel locking T-latches on diamond plate doors and chain hanger in each outside compartment. 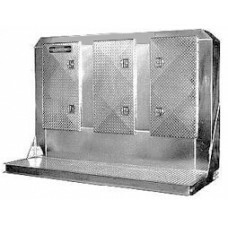 CENTER CABINET CAB RACK – diamond plate ribbed panel welded on the hept-tube cab rack frame, diamond plate doors have stainless steel locking T-latches, the enclosure has a top shelf and a chain hanger installed. DROM ENCLOSURE – Three compartment, 14” deep, Drom enclosure with 50 cubic feet of storage, neoprene bulb-type seals and stainless-steel T-latches on diamond doors and chain hangers in each side compartment. DROM CAB RACK -Drom standard cab rack with ribbed diamond plate panel welded into a tri-tube frame, 26”H gussets and a diamond plate cargo deck rated at 1,000 lb./LFT. The side rail inside flange takes flat-hook straps. 86"H X 96"W - Drom Enclosure, W/ 14"D Cabinets W/ 3 Doors, T-Locks, 2 Chain Hangers, 2 Shelves, 2'6"..
Drom Cab Rack W/ 14" Enclosure, 3 Doors & Mt Kit ..